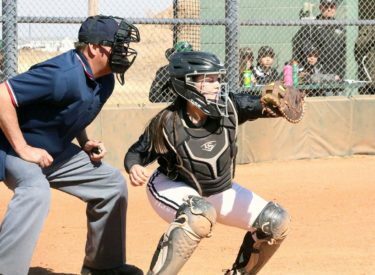 LIBERAL, Kan. – On a windy day at Lady Saint Field, the Seward County softball team (9-11) split their home doubleheader against Clarendon, winning game won 10-5 before getting mercy ruled in game two 14-3. Monique Ashley (9-3) started in the circled in game one, pitching a complete game. She gave up five runs on 10 hits while striking out six Bulldogs. Jullian Atteberry knocked two out of the park, while Sage Harrison hit her sixth home run of the year. The scoring had wait until the third inning with Atteberry putting the Lady Saints on board first with a solo home run to centerfield. An inning later, Harrison connected on her home run to lead off the inning. A walk by Leena Mortensen followed by a Sydney Epp double put runners at second and third. Mortensen stole home on the next pitch to make it 3-0 Seward before Miranda Nester grounded out to first to score Epp, making it 4-0. Clarendon evened up the game in the top of the fifth with a four-run inning. A double and a single put runners at first and third for the Bulldogs. Jasmin Marticorena hit a sac fly to left field to score the first run. Mariah Miramontez followed up the sac fly with a triple to score Marticorena, making it 2-0. Two straight singles to left field scored two more runs, tying it at four. The tie didn’t last long as Atteberry connected on another solo home run to lead off the bottom of the fifth. Two singles put runners at first and third, allowing Harrison to hit a sac fly to centerfield, scoring the runner at third, making it 6-4. The Lady Saints kept their scoring going in the bottom of the sixth. An error and a single put runners in scoring position for Atteberry, who singled on a line drive to left field to score the first run. Kaitlin Ammermann flew out to right field for the second out of the inning, but three straight singles Madeline Owen, Harrison and Mortensen scored three more runs for Seward to bring the score to 10-4. Clarendon only managed one run in the top of the fifth, coming from a one-out solo home run by Kayla Hill to bring the game to 10-5. Errors led to the loss in game two, as the Lady Saints committed eight in the game. Jordan Cordrey (0-6) earned the start, pitching 2.2 innings. The Bulldogs scored 12 runs off of six hits on her, but none of the runs were earned. Corrina Porras finished the game, pitching 2.1 innings. Porras gave up two runs on five hits in relief. Two straight errors by Atteberry were a sign of things to come by the Lady Saints, as the second error scored the first run for the Bulldogs. A third error in the inning by Atteberry scored another run to make it 3-0, before a double scored the baserunner to give a large early lead for Clarendon. The troubles continued in the top of second. A single gave the Bulldogs a baserunner, but two errors on the hit allowed her to reach home on the same hit, making it 5-0. Seward finally got on the board in the bottom of the second with a leadoff home run by Mortensen. It was all the Lady Saints could get in the inning. With two outs and two runner on in the top of the third, another Atteberry error scored the sixth run of the day for the Bulldogs and kept the inning alive. Clarendon took full advantage, as Regina Garza doubled to centerfield to score two more runs, making it 8-1. Four straight balls with the next at-bat put runners at first and third. An error on a ground ball to first base brought another run home. A home run with the next at-bat scored three more runs to make it 12-1. Seward couldn’t get any more to go in the bottom of the third, but the Bulldogs extended their lead in the top of the fourth. A leadoff home run made it 13-1. The Bulldogs put runners at first and third with two singles and Taylor Hewlett grounded out second to score the final run Clarendon. Seward needed two big innings to keep the game going and not get mercy ruled. They managed two solo home runs from Harrison and Epp, but couldn’t get any more, losing 14-3. The Lady Saints will get back to conference play on Wednesday (March 7) at 2:00 p.m. for a doubleheader against the Pratt Beavers at Lady Saint Field.